~Pope Benedict XVI Angelus Message October 5th, 2005. October is dedicated to the Rosary. Many miracles are associated with the praying of the rosary but few are as dramatic as that of the Battle of Lepanto. It was this battle on October 7, 1571 which was the occasion by which the Church dedicated October 7 as the Memorial of Our Lady of the Rosary. Though there are many conflicting accounts of its history – steeped in both fact and legend – early use and development of the Rosary is closely associated with the order of Dominican friars. It was during the middle of the 15th century that the rosary was first popularized by Dominican Alain de la Roche. The devotion continued to develop through the 16th century, eventually consisting of 150 Hail Marys, to parallel the 150 Psalms that were recited by religious orders as part of the Divine Office. Keeping track of prayers using small items such as pebbles is an ancient tradition that pre-dates Christ. In the case of the Rosary, stones were originally used which eventually gave way to beads strung on a cord. 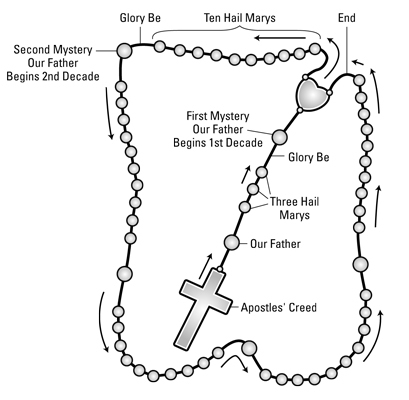 The rosary is a combination of repetitive spoken prayer and meditation upon the central Christian mysteries of the Gospel. The repetition of the prayers is intended to leave the mind free to ascend to God, thus allowing expression of inner thoughts and feelings that extend beyond the capacity of verbal expression. In the course of praying each decade of the rosary – a decade consists of one “Our Father” and ten “Hail Marys” – one meditates on a particular mystery in the life of Christ, such as the Crucifixion or His Ascension. Though Marian in nature, the rosary is a Christocentric devotion. This means that through the rosary Mary prays with us and intercedes for us with her Beloved Son as we focus on the key events of His life, death and Resurrection.